Professor Allison Stanger was assaulted and her neck was injured when someone pulled her hair as she tried to shield Murray from the 20 or 30 people who attacked the duo outside the McCullough Student Center, said Bill Burger, a vice president for communications at Middlebury College. Burger said people in the crowd, made up of students and "outside agitators," wore masks as they screamed at Murray. Murray wrote the controversial 1994 book, The Bell Curve. A New York Times bestseller, the book sought to link social inequality to genetics. The Southern Poverty Law Center considers Murray a white nationalist. "The demonstrators were trying to block Mr. Murray and Professor Stanger's way out of the building and to the car," Burger said. "It became a pushing and shoving match, with the officers trying to protect those two people from demonstrators — and it became violent." "This was an incredibly violent confrontation," added Burger, who described the crowd as a "mob." On Friday afternoon, Middlebury College president Laurie Patton sent a statement to all students, faculty and staff describing how "deeply disappointed" she was by the incident. "I know that many students, faculty, and staff who were in attendance or waiting outside to participate were upset by the events, and the lost opportunity for those in our community who wanted to listen to and engage with Mr. Murray," she wrote, later adding: "I extend my sincerest apologies to everyone who came in good faith to participate in a serious discussion, and particularly to Mr. Murray and Prof. Stanger for the way they were treated during the event and, especially, afterward." Murray had been invited and scheduled to speak at Wilson Hall Thursday afternoon. But a jeering and booing crowd of students turned their backs on him and shouted down his attempts to speak. After about 25 minutes, administrators resorted to plan B: moving Murray to a private room and streaming the video of his speech online. Students continued to make a ruckus as Murray spoke from the private room with occasional questions from Stanger, a professor of international politics and economics. About half an hour after the event ended, Burger said, the two, accompanied by a college administrator and two public safety officers, tried to leave the building via a back entrance and hurry to a car. But protesters had surrounded various entrances and swarmed to the fleeing Murray and Stanger as they exited, he said. Burger said someone threw a stop sign attached to a heavy cement base in front of the car. It finally got free of the crowd and then left campus. Members of the Middlebury Police Department eventually arrived on scene, said Burger, who did not know of any arrests. He said members of the campus public safety department, who are unarmed, "put themselves in harm's way to permit this car to leave." "It was a very, very dangerous situation," Burger said. Senior college administrators held an emergency two-hour conference call Thursday night and another meeting is scheduled for this afternoon, Burger said. The school will look into arrests and other discipline for "what were clearly violations of our policy," both during the disruption of the lecture and the violent, chaotic aftermath, he said. Administrators plan to review video and pictures to discover who was involved. "It's fair to say this is consuming a lot of our time," he said. Stanger visited the emergency room for treatment of her injury and is now wearing a neck brace, Burger said. Murray was not injured, according to Burger. Stanger did not immediately respond to a request for comment, nor did Murray, who alluded to the incident Friday morning on Twitter. "We were prepared for the disruption of event, which is why we prepared the backup plan for the live stream," Burger said. "We were caught by surprise by the violent acts as Mr. Murray and Professor Stanger left the building." The Middlebury incident comes approximately one month after the University of California, Berkeley, canceled a planned lecture by right-wing provocateur Milo Yiannopoulos amid violence. Some 1,500 people protested peacefully, according to the university, but approximately 150 "masked agitators" who used "paramilitary tactics, including hurling Molotov cocktails, setting fires, throwing fireworks at police, pushing barricades into windows and damaging campus and city property." The protesters there caused approximately $100,000 in damage to the campus, the university said. "While we have made clear our belief that the inflaming rhetoric and provocations of Mr. Yiannopoulos were in marked opposition to the basic values of the university, we respected his right to come to campus and speak once he was invited to do so by a legitimate student group," Chancellor Nicholas Dirks said in a statement. "The violence last night was an attack on the fundamental values of the university, which stands for and helps to maintain and nurture open inquiry and an inclusive civil society, the bedrock of a genuinely democratic nation." Patton, the school president, attended Murray's lecture. Some booed her as she received a large round of applause and took the stage. Patton said she "profoundly disagree(s) with several of Mr. Murray's views," but attended in support of free speech on Middlebury's campus. 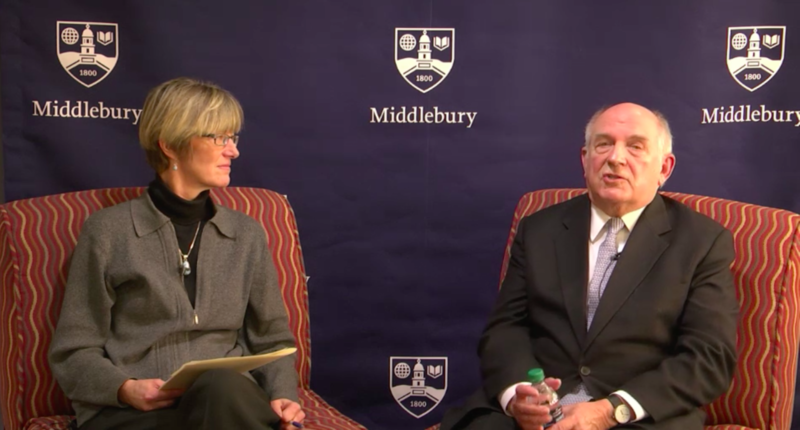 "I know, from our community conversations of the last week, that there are some here who might wish to exercise their right to non-disruptive protest at Middlebury, and I wish to state, if you'd like to do so, please do," Patton said. Alex Prolman, who helped organize the protest against Murray's lecture, said he is not a student but a "concerned community member." He helped write news releases and described his role as connecting students with members of the press for coverage of the event. "There was a plan from the students that had emerged to prevent Murray from speaking, and I think they were largely successful in that," said Prolman, who attended the lecture. Reached by phone Friday morning, Prolman, a Burlington resident, said he was headed to the Middlebury campus for a student meeting about next steps. He declined to say much about what happened outside the building. "I'm still a little hesitant to comment on this at this point," he told Seven Days.